The new law on trade will ban retirees or persons who hold freelance jobs from also working at the open air markets. According to the law, which goes into effect in 2019, these categories of citizens will not be able to rent a selling booth at one of these markets, which are frequently main source of revenue for small scale farmers. The Chamber of Commerce estimated that this law will cut trade at the farmers markets by as much as 30 percent and appealed that it is delayed. – Any person who wants to trade at an open air market should be allowed to do so. The Government already has a procedure in place how to tax this commerce and to collect income tax from the sellers. I see no reason why these categories of citizens would be exempt from trading at these markets – said Daniela Mihajlovska from the Chamber of Commerce. 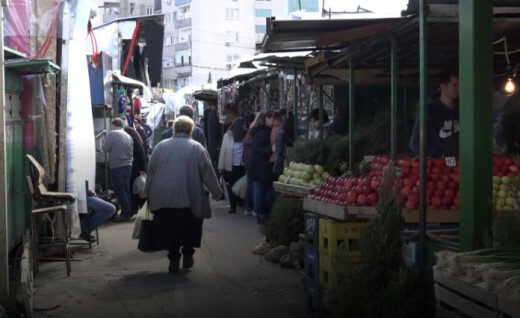 A well publicized recent incident showed an inspector from the Centar municipality in Skopje kicking the merchandise of an elderly woman who set up an improvised shop to sell nuts near the Bunjakovec market in downtown Skopje. The move drew criticism between the left wing commentators who supported the SDSM Government. Law professor Dimitar Apasiev accused his former Colored Revolution protest colleague Branimir Jovanovic, who was named adviser to Finance Minister Dragan Tevdovski, of punishing the poorest classes of citizens with his regulatory policies. – I hope my comrade Branimir Jovanovic will explain to me how the poor benefit from this law? Also the well spoken spokesman Mile Bosnjakovski. Tell Prime Minister Zoran Zaev that this crazy move punishes THOUSANDS OF OUR POOREST CITIZENS and prevents them from having any legal source of additional income, Apasiev wrote on his social media account.